The 2013 NFL season returned with an emphatic message last night. The same old sheriff still runs this town. Under the shadow of the giant Joe Flacco banners controversially dotted around Peyton Manning’s (above) home stadium, it all kicked off again. Forced to forego tradition and play their first game on the road, the defending Super Bowl champions, the Baltimore Ravens faced off with one of this years favourites at Sports Authority Field at Mile High in Denver. The misjudged decision the NFL made to hang commemorative Ravens banners around the stadium, and across the city of Denver, added fuel to the fire of the Broncos fans. Not that it was needed. The Broncos fans are some of the most raucous in the league, and with Denver’s home field situated at that aforementioned mile high altitude, this was a baptism of fire for the Ravens Super Bowl defense. After a 35 minute delay for lightning, the game finally got underway. The Broncos winning the toss, deferred to receive until the 2nd half, so the first phases were to come from the Ravens. Having signed a new $120m contract over the summer, all eyes were on Ravens QB, Joe Flacco. The Ravens entered the game with questions over their offensive execution, with Anquan Boldin, one of Flacco’s favourite options last season now in San Francisco. Yet Torrey Smith did much to dispel these doubts as he and Flacco (below) connected twice early on for considerable gains. Baltimore undoubtedly had settled the quicker of the two sides and they were rewarded when Flacco found Full Back Vonta Leech around the corner of the Broncos defensive line for the first touchdown of the new season. The Ravens convincing start would have surprised many who expect them to find life tough without Ray Lewis and Co. this season, but the game would swing in the Broncos favour after a couple of pivotal moments. Ravens hero of the Super Bowl, Jacoby Jones called for a fair catch on a punt return, but disaster struck for Baltimore when Safety Brynden Trawick collided with him, leaving the ball to run loose. The collision was to put an end to Jones night, and significantly limit Flacco’s receiver options. Indeed on the following play, Flacco failed to find one of his men, and his pass was spectacularly picked off by Broncos Cornerback Chris Harris who had just managed to slip under the coverage in time. This allowed Peyton Manning to enter the field deep in Ravens territory with the chance to turn the screws. As he has done so often down the years, he immediately punished the Ravens for their error. 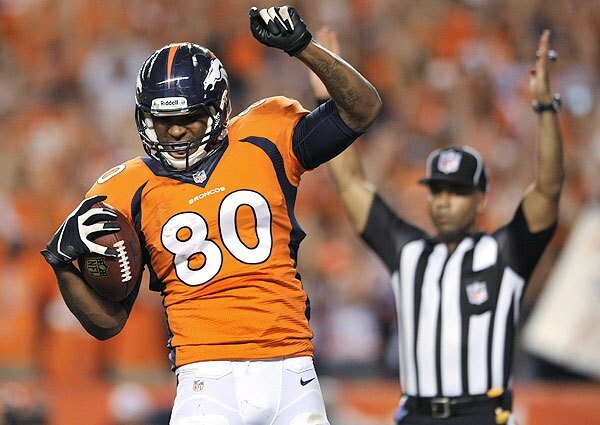 Manning dispatched the ball, moments before he got hit, leaving Julius Thomas (below) with a clear path to the end zone. Wes Welker was having a solid competitive debut, showing that there was already an understanding growing between him and Peyton Manning from early in the game. 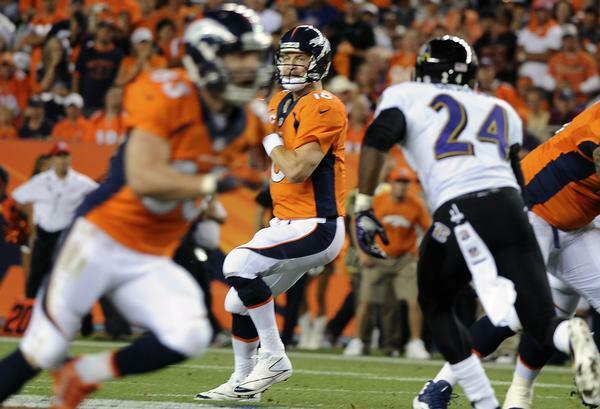 It wasn’t all smooth sailing for Welker though as a muffed punt was recovered by the Ravens at the Denver 2 yard line, and followed up by a simple Ray Rice touchdown to allow Baltimore to regain the lead. The Broncos responded almost immediately though, with a couple of quick completions between Manning and Julius Thomas, culminating in Thomas getting his second touchdown of the night. Before half time, Dallas Clark was to blow a couple of big opportunities with dropped passes, meaning that the Ravens would have to settle for a field goal and a 3 point lead at the break. The defining moment of the game was to come at the beginning of the second half. On a quick 3rd down, Peyton Manning threw to Welker for a vital completion. Replays showed that Welker had in fact fumbled the pass, and despite his players calling for a challenge, Ravens coach John Harbaugh did not send the call upstairs for review. This resulted in a set of snaps which culminated in Manning picking out WR Andre Caldwell in the corner for his third touchdown pass of the night. From this point the Broncos never really looked back, with Manning’s arm clicked in gear. On the flip side, the promise shown by the Ravens in the first half was disappearing rapidly. 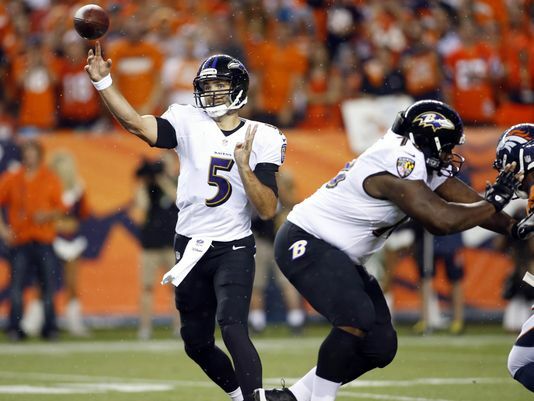 Flacco was sacked by Offensive Line Backer Shaun Phillips, the first of two sacks for him on the night, before a Baltimore punt was charged down. 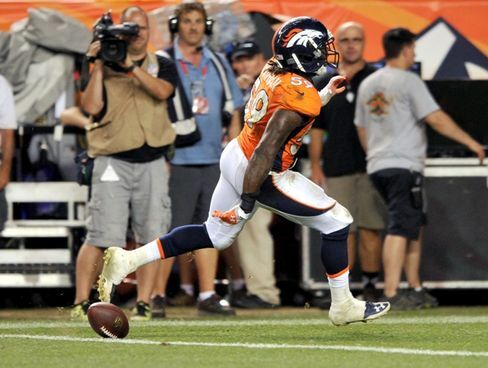 This gifted Manning with the opportunity to hit Wes Welker in his element. One on one in the play option, with a perfect angle to spin his man, 6 points was the inevitable outcome. Minutes later, Welker (below) was left wide open and Manning, cruising at this stage, found him again. Denver’s lead was now 18. Manning’s hot opening night was to continue in the 4th. As he twice found Demaryius Thomas with medium length passes for touchdowns, as one of the Broncos key receivers last year got in on the act. The Ravens attempted to pull themselves back into the game, but their attempts were in vain. The game would have been killed off much earlier also, if youngster Danny Trevathan had carried the ball over the line, rather than dropping it short. Having picked off Flacco’s pass, Trevathan (below), who was making only his first start, excitedly charged through, dropping the ball in preparation for a lavish celebration of his first touchdown. Although he will have to keep waiting for that moment, he did at least earn himself a blast of hot air from defensive coordinator, Jack Del Rio. In truth this night belonged to Peyton Manning though. Despite now being 37 years of age, Manning worked as hard as ever on his game during the off-season with his brother, Eli of the New York Giants, and their college coaches as has become tradition. Last night Manning found himself having to reel his arm in, as the Ravens determined to stifle Demaryius Thomas and Eric Decker restricted his options to short and medium length passes. This didn’t faze him in the slightest though as he went for 27/42 passes, while his 7 TD’s equaled the league’s single game record. In fact, Manning’s 7 TD’s last night was only one shy of the Kansas City Chiefs total for the whole of last season. A big factor in the margin of Denver’s victory last night was Manning’s effectiveness at running the “no huddle” offense. This lightning fast offensive style, made popular by Chip Kelly at the University of Oregon is likely to be seen frequently across the league this year. In the 3rd quarter when the Ravens offense was particularly ineffective, Manning’s “no huddle” was leaving the Baltimore defense with little to no time to breathe. As exhaustion set in, the gaps in the defense widened. Although it will be much imitated this year, we’ll rarely see this style of offense run better than Denver did last night, if at all. What last night tells us is that Denver may well be the real deal this year, and that in the town that is the NFL, Peyton Manning is still the sheriff. Very thorough recap — keep it up! Likewise! Thanks for checking it out! Very nice recap! I think this game really highlighted just how quickly things can turn in football. Bottom line…Denver is scary and Baltimore has some work to do. Thanks a lot! Absolutely, in both a game and the overall shape of a franchise. The really scary thing is that the Broncos have a relatively soft schedule in the near future, they could really build up a head of steam. Ravens on the other hand need to grab some wins sooner rather than later or there’s a danger the season could get away from them. Thanks a lot! I’ll be keeping an eye on your posts too! Great, thorough review of the game. It was easy to follow your description of the events that took place. It read well and was a perfect recap to a historic game that will be remembered for a long time to come. Great job!